Who can deny the natural beauty of wood? It's an elegant and warm material and garage doors made of wood can be an excellent choice for both modern and classic homes. 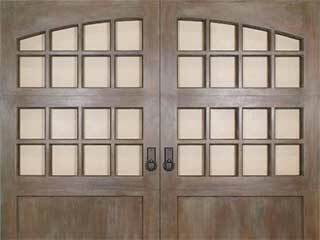 It's not a surprise that people are still investing in wooden doors despite a plethora of other materials on the market. If you're thinking of replacing your garage door with a wooden one, we've come up with a few points which may help to inform your decision! Living In A Humid Or Rainy Area? Wood is sensitive and often not recommended for high moisture areas since it has the ability to absorb moisture like a sponge. This can be the main reason why it warps. Cold and hot temperatures can have a negative effect too - too much cold can increase moisture while too much heat can dry out the material. Have You Considered Faux Wood? If you're living in a climate like this, natural wood might need extra maintenance in the long run but faux wood hardly requires this kind of extra care - it's not a coincidence that most manufacturers produce a long line of composite lumber doors! The great thing about faux wood and composite options is that they can give the look of natural wood while being highly resistant and unlikely to be warped or influenced by weather conditions. What's great is that few are likely to recognize the difference. You might be surprised to learn that you can also get a wooden look with a steel door. Many woodgrain paint finishes today can give your steel door the look of wood without any of the downfalls in terms of maintenance and cost. Hopefully, we've presented a few options here for achieving a wooden look if 100% wood is not an option for you. For assistance in sourcing the right door for you and organizing the installation, just get in touch with us at Garage Door Repair Justin in Texas!